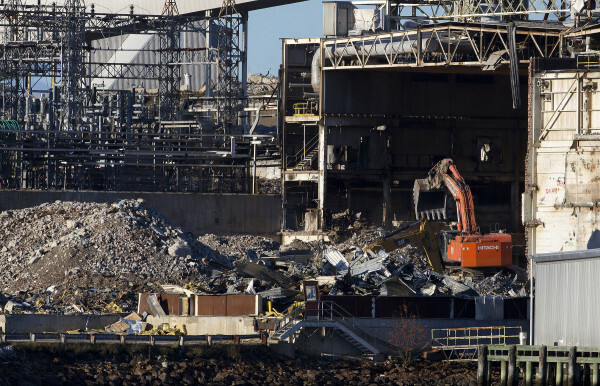 Backhoes work to tear down the former Verso Paper mill on Friday in Bucksport. 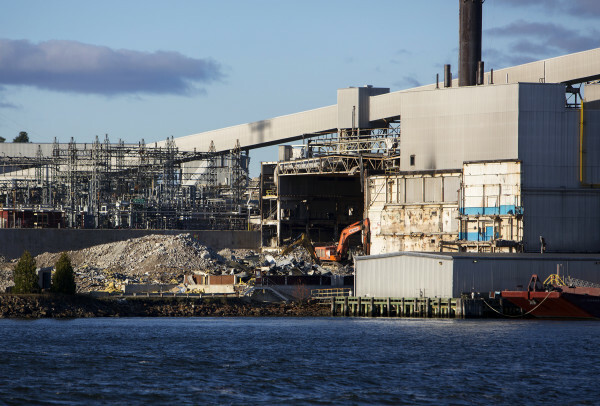 The former Verso Paper mill can be seen Friday in Bucksport. Sen. Angus King (second from left) and Bucksport officials discuss the potential redevelopment of the former Verso Paper mill on Friday in Bucksport. 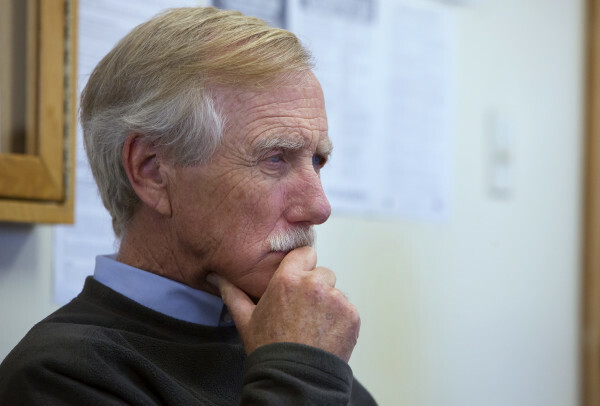 Sen. Angus King listens as Bucksport officials discuss the potential redevelopment of the former Verso Paper mill on Friday in Bucksport. BUCKSPORT, Maine — This former mill town, perched on the edge of the tidal Penobscot River, has a new wine bar and is in the process of getting a new downtown arts center, gas station and convenience store, and a wastewater treatment plant. 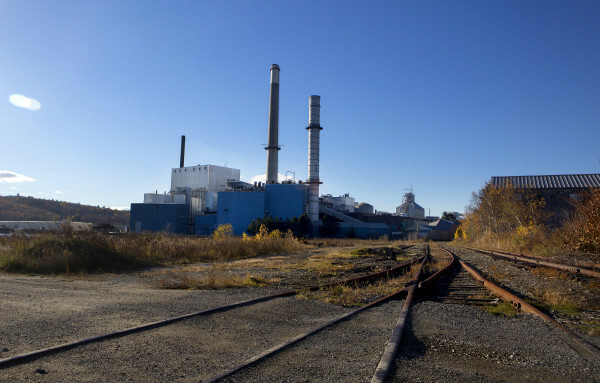 The economic activity these businesses and projects are generating in town might not attract as much notice if not for the absence of the once-dominant employer in town: the aforementioned paper mill. Verso Paper, the final owner of the riverfront paper manufacturing facility, shut the mill down nearly two years ago, laying off 570 people and bringing Bucksport’s 84 years of papermaking to an end. Since then, not a day goes by for most residents without them wondering at least two things: What’s going to become of the 250-acre mill property, and what does it mean for the future of Bucksport? 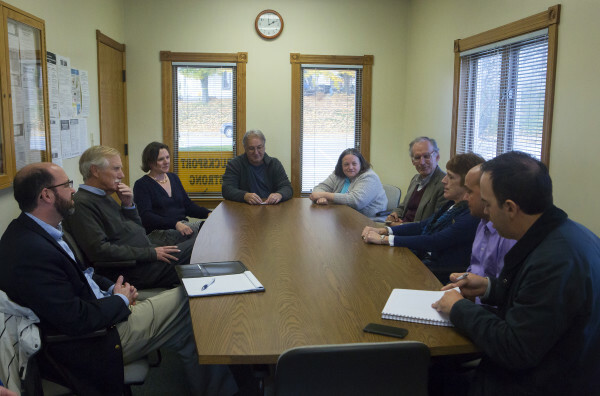 Susan Lessard, Bucksport’s town manager, had an answer to that second question on Friday, when she and other town officials met with U.S. Sen. Angus King at the town office. King met with Lessard and other town officials on Friday to find out about the status of the mill demolition project and to get briefed on what prospects there are for redeveloping the site for commercial and industrial use. He was told that the demolition is ahead of schedule, with a projected completion in March 2017, and that there have been a few inquiries from entities about building at the mill site once the buildings are gone. Maine Maritime Academy, which has expressed an interest in establishing a commercial marine training facility at the mill site was the only one identified during the conversation. Lessard said that, given the existing infrastructure development at the site, the town is not looking to significantly change the type of use for the property. Not only is it adjacent to a deepwater port and have rail, natural gas, broadband access, three-phase power and an existing power plant on site, she said, but the area’s workforce is well-suited for supporting industrial activity. The site’s location at the head of Penobscot Bay, where the ocean blends in with the Penobscot River, makes it an ideal place for commercial marine activity of some sort, town officials told King. A Maine Maritime training facility would be “such an anchor,” Lessard said, by bringing 2,500 to Bucksport each year and would complement existing marine trades such as Belfast-based Front Street Shipyard, which is building multihull boats at the town’s industrial park. the federal government — which in August sent a cadre of officials from various agencies to Maine to look into ways to help Maine’s forest products industry — has several economic development programs available. What kind of assistance the feds can provide, he said, depends on how the mill site is redeveloped. King said that taking a multifaceted development approach rather than finding a single, large-scale employer is a much more prudent and realistic approach in the modern world of global economics. Finding multiple companies to move in is more feasible and will reduce the economic impact to Bucksport and the region should any one of them fail, he said. “I think that is better strategically, and I think it is more achievable, and they can achieve it over time,” King said. As for the rest of the town, the closure of the mill is forcing local residents to address the town’s need to diversify, but it also has helped expedite the process. Main Street Bucksport and Community Heart & Soul are two recently created, community-led efforts aimed at downtown economic development and in establishing a collective vision for Bucksport’s future. Brooke Minner, head of Main Street Bucksport and co-owner of Ocean’s Edge Realty, said home sales in Bucksport were pretty nonexistent in 2013 and 2014, right before the mill closed. But in the 23 months since, she said, they have been getting more inquiries from people who see Bucksport more as a coastal Maine village than a mill town. Lessard said that, whatever the future of the mill site may hold, residents are not waiting around to start redefining what kind of place Bucksport is.